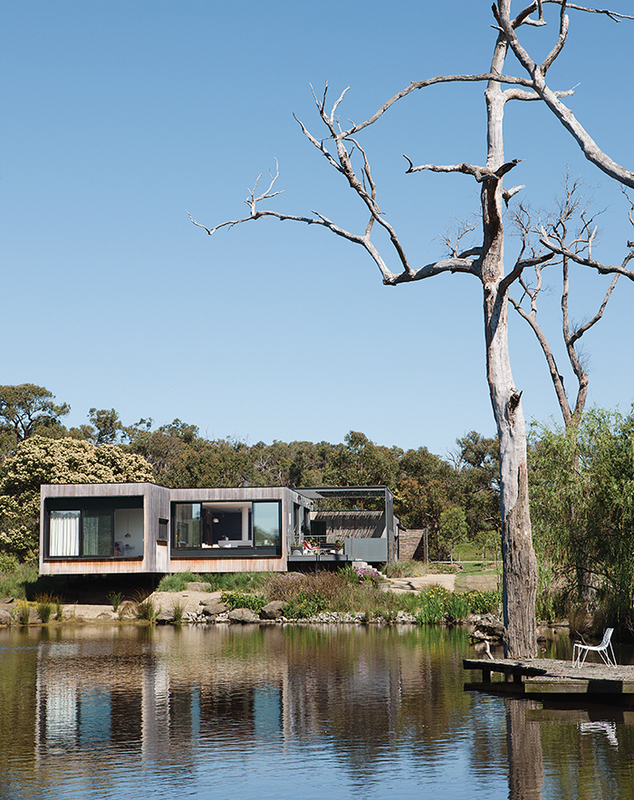 Perched above a lake on Australia’s verdant Mornington Peninsula, James and Imogen Tutton’s teak-clad house was designed by Karen Alcock of Melbourne-based MA Architects. 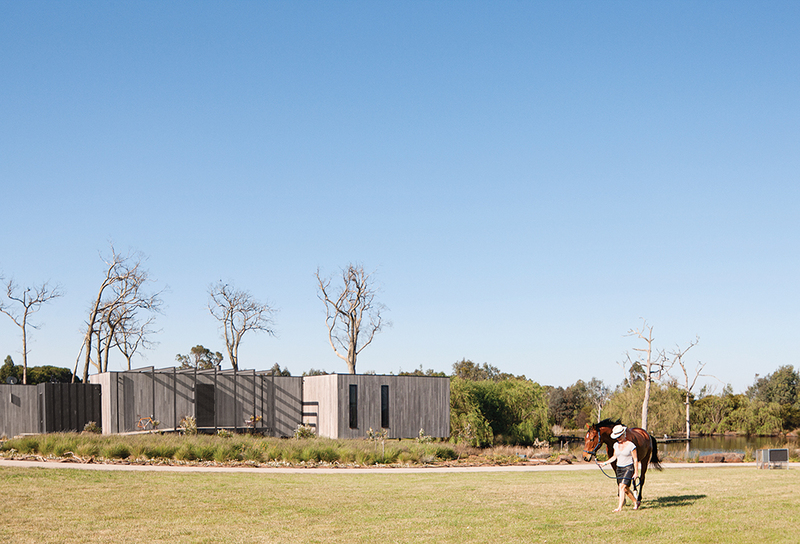 The 16-acre property includes room for the family’s horses and a portable chicken coop. The house comprises a series of modules, with the main living areas occupying the center and the master bedroom on the right. A large deck juts off the living room. Harper sits on the porch just off the entrance. James notes that the children spend their time “swimming in the dam, feeding the chickens, and riding their ponies or bikes. It’s really just the simple stuff that we had when we grew up in the late ’70s and ’80s." With a large glass door from Capral that opens completely to the elements, the master bedroom becomes part of the landscape. Imogen sits with Millie, one of the family’s two greyhounds. The art is by Noel McKenna (top) and Ray Crooke; the butterfly chair cover was custom-made by a saddler. The carpet is from Supertuft. Tom Dixon pendant lamps hang above a steel-and-marble dining table by Chris Connell topped by Kate Hume vases and surrounded by painted Thonet chairs. The wood-veneer cabinetry in the adjacent kitchen complements the rich Grigio Carnico marble on the island and backsplash. “The kitchen has a deliberately dark palette,” James says. The couple worked on the interiors with project architect Maria Danos. In the living room, an Arco lamp by Flos arches over a Jean-Marie Massaud for Poltrona Frau sofa, which joins an Antonio Citterio for B&B Italia coffee table, a Patricia Urquiola rug, and three-legged stools by Chris Connell. The bucolic Mornington Peninsula, southeast of Melbourne, Australia, is a long, narrow finger of land that curves around to define the sandy shoreline of Port Phillip Bay, a bustling maritime playground and highway for every conceivable watercraft. Move inland from the suburban sprawl of coastal towns to the rolling hills of the peninsula’s interior, and the diversity of geology and landscape becomes abruptly apparent. For many, the prolific vineyards, offering acclaimed cool-climate wines, cellar-door tastings, and onsite restaurants, are reason enough to visit the area. But the peninsula also provides a unique opportunity to live in native bushland moments from secluded coves and rugged surf beaches. 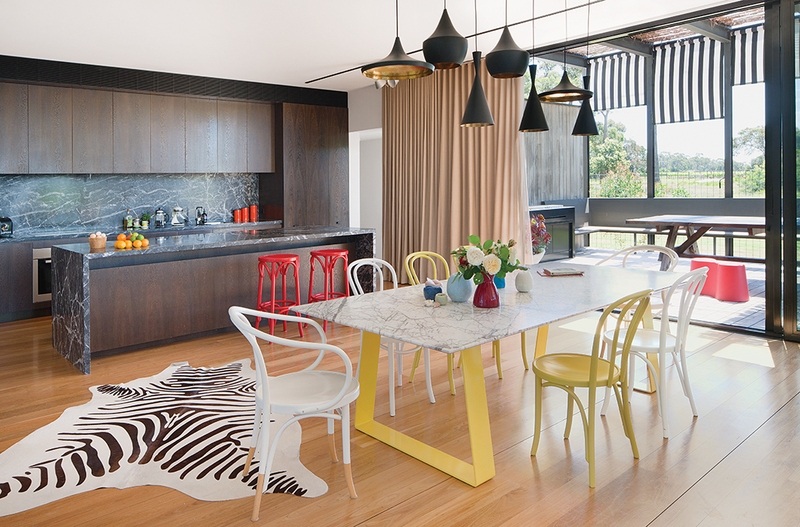 After a stint living in Los Angeles and then Australia’s Byron Bay, James Tutton, a director at Neometro, a residential development company, and his wife, Imogen, a competitive equestrian, returned to Melbourne with their young children, Cassius and Harper. They acquired 16 acres on the peninsula, with a plan to build a hobby farm and visit regularly from the city. Being within commuting distance of Melbourne was key, especially to James, who, in addition to his post at Neo-metro, serves on a handful of start-up boards in the city and recently co-founded a nonprofit organization, Smiling Mind, that teaches young children meditation. When an opportunity arose to buy the neighboring land (including a garden, lake, and vineyards) together with James’s business partner—who’s also a local wine producer—the family decided to move to the peninsula permanently. “It was an easy decision to make when factoring in access to the city and quality of life for the kids to grow and explore,” says James. And Imogen would have the room she needed to set up a well-built equine facility consisting of stables, an arena, and paddocks for her three horses. After determining that the peninsula was to become their permanent home, the couple turned to Karen Alcock of MA Architects, the Melbourne firm that Neometro uses for the majority of its projects. Alcock designed a simple, robust, and slightly elevated building with a modest floor plan considering the wide-open space available. The flat-roofed house appears to hover over land and water; in fact, its eastern end cantilevers over the lake. “We deliberately chose to keep the design restrained, as the natural setting here is the highlight,” says Alcock. But while the exterior of the house is discreet, its textured and detailed interior is a true contrast. Inside, the open-plan living area looks and feels exceptionally spacious, due to the slightly higher than normal ceiling and the floor-to-ceiling sliding glass doors. “It’s my urban-rural mash-up,” says James. The gravel drive that meanders through landscaped gardens and rows of vines arrives at the house from the south, then curls around to form a circular drive in front. A wide concrete ramp with exposed aggregate leans toward the front door, allowing for a gradual arrival and a moment to take in the architecture and the surrounding landscape. The untreated teak cladding on the house was suggested by the Tuttons, who love the natural weathering and grayness of the timber. “The design needed to work and look good from all directions, as there are no blind spots here,” says Alcock. As the house was being built, Imogen was studying horticulture and was able to apply her newfound knowledge to various areas of the property. She asked for massive boulders to be relocated and placed just so at the right vantage points. She also arranged for native plantings to crawl up and under the cantilevered portion of the house, enhancing its light tread on the land. The couple plan to add a separate structure near the house that will contain a study, guest room, and gym. “Nothing too elaborate,” says James, “but with growing children in mind, this will eventually become one of the kids’ own areas. I think it’s good for kids to have their own space.” In this part of the world, space is one thing the Tuttons have in abundance.